The Canterbury Motor Car Company. Homepage. This page: A look at an all-but forgotten motor-car manufacturer located in Kent circa 1904. Canterbury Cars sales catalogue from 1904. In the early years of the 20th Century, many budding motor-car enthusiasts eyed the increasing take-up of the horseless carriage with interest, and sought to carve themselves a slice of the action. Some were already well versed in business life, perhaps having a background in producing bicycles, stationary engines, steam appliances or other items of an engineering bent. For others it would be their first attempt at running their own business. Regardless of whether they were new to manufacturing or not, most of the early pioneering motor manufacturers, or aspiring manufacturers, failed after a few short years. Those that did establish themselves, and managed to keep in business during the 1914-1918 war, perhaps by switching to munitions work, would find it a tough battle to maintain sales with the launch of dependable motors from the likes of Austin, Singer, and Morris. The images on this page were emailed over by Les, a regular email contact of mine. They were all taken from a 1904 sales catalogue issued by the Canterbury Motor Car Company, of The Pavilion, Canterbury, Kent. This veteran-era car, like the Speedwell Light Car produced by Frank Morrish in 1904, was a new one to me. "At the present stage of public appreciation of the Motor Car, it is hardly necessary to point out its many and striking advantages to private users, military and professional men, doctors, engineers, and commercial men, and others whose pleasure or business requires them to easily and quickly reach widely-separated points, while landowners and farmers are beginning to appreciate the advantage of the Motor in such ways as the getting of perishable goods to market at a minimum cost, and in condition to obtain the best possible prices. For the latter we have produced the "Canterbury Lorry", a light commercial car carrying from 15 to 20 cwts at an average speed of fifteen to twenty miles per hour, and at a cost of not more than 0.75d to 1d a mile for fuel and lubricating oil." "To each and all of these the "Canterbury Cars" appeal with special force, on account of their simplicity, moderate first cost, and very low expense of up-keep. All parts of our cars are standardized, and in case of any accident, broken or damaged parts can be quickly replaced. We make a feature of supplying spare parts by return of post as far as possible, and if necessary we send skilled workmen by car, train, or bicycle to any point, no matter how distant." "Throughout the Canterbury Cars we have employed only the very best material and workmanship. All the new improvements are the result of exhaustive tests, and we have spared no expense to turn out the very best possible car compatible with moderate price." 1904 Prices for the Canterbury car. 8hp One Cylinder, Three Speeds, Two Seats - 175 Guineas. 8hp One Cylinder, Three Speeds, Four Seats - 195 Guineas. 10-12hp Two Cylinders, Three Speeds, Two Seats - 235 Guineas. 10-12hp Two Cylinders, Three Speeds, Four Seats - 250 Guineas. 15-20hp Four Cylinders, Three Speeds, Four or Five Seats - 500 Guineas. "Terms. One-third cash with order and the remaining two-thirds on delivery at our works. Until the final payment is made the car remains the property of the Company, who will give the Customer all reasonable trials on the road to prove that the car is in perfect order." 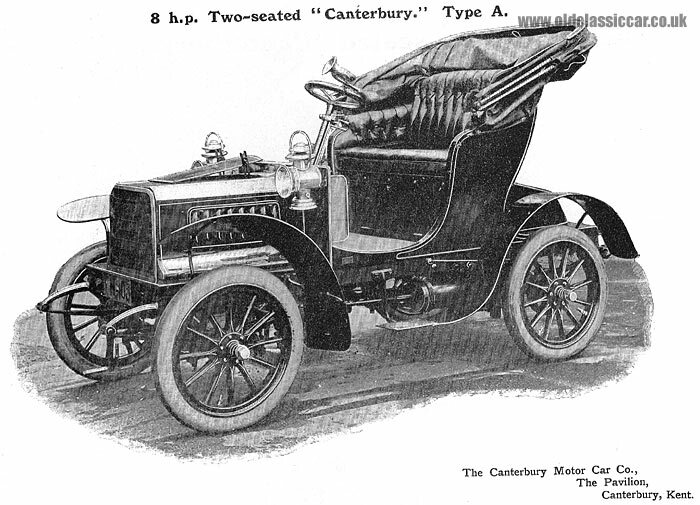 The 8hp Canterbury Type A. The Type A was the smallest car in the Canterbury range, a car ".. in many ways superior to the large number of small low-priced cars at present on the market. It is thoroughly up-to-date, and has ample power". The basic list price for the two-seater Type A was 175 Guineas. If you wish to benefit from a hood, you'd need to pay a further 10 Guineas. A toolbox would cost you an extra 2 Guineas, and a third seat 5 Guineas. As with many cars of its type and era, it was powered by a single cylinder water-cooled De Dion engine. The chassis comprised "armoured" wood, steel flitch plate, and a heavy-gauge tubular under-frame. The ignition system came courtesy of De Dion, and in all there were three brakes fitted to the car. Wheels were 700x85 artillery type, the car having a wheelbase of 6ft 6 inches. The gearbox incorporated three forward speeds, plus reverse, enabling the Type A to achieve a maximum speed of 28 miles per hour ".. on good roads". The trim was upholstered in leather, to a colour chosen by the purchaser. I doubt many Canterburys were sold. The marque receives a nod in The New Illustrated Encyclopedia of Automobiles, advising that cars were produced from 1903 to 1906 only. It refers to a 6hp De Dion powered voiturette (no mention of the 8hp Type A), and a "12hp Aster-engined Roi-des-Belges model styled on the Mercedes". There is also a brief reference within the pages of Motoring Around Kent - The First Fifty Years, although no photographs. If anyone can help with photographs of a Canterbury, whether in period or preserved now, please drop me a line. Thanks again to Les for sending this over.